Unpack your trees from your box, removing all packing materials. Carefully untangle the roots and rinse off shavings. Soaks the roots in water, using a bucket or wheelbarrow to fully contain the roots, for at least 3 hours and up to 24 hours. Do NOT allow the tree roots to dry out. Remove all the sod in the area where you plan to dig. Dig a hole big enough to hold the full root ball when it’s fully spread out. This should be at least 3 feet in diameter for a tree. Loosen all the soil in the hole to ensure the tree is able to grow feed roots easily. Your hole should be one foot wider and one inch deeper than the roots. 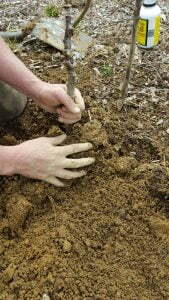 Work in the remaining soil by hand or by shovel. Hold the tree vertical (help is nice here to ensure you have the tree lined up correctly) while doing this. Using your foot, tamp down the soil gently to slightly below the surrounding ground. Using a half-filled 5 gallon bucket, water the tree and let the water soak in. Spread natural wood mulch (no dyed or cedar mulches) approximately 2 inches deep to cover the area that you dug. Avoid mounding mulch up around the trunk, no mulch volcanoes! If it is dry, add one more half-filled 5 gallon bucket of water. If not, then leave the tree alone. 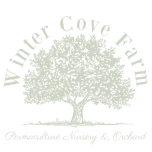 During a normal precipitation year, you should not need to water the tree if it is mulched well. During times of drought, give your newly planted trees one half-filled 5 gallon bucket of water, around the mulched area, once per week. Do not drip irrigate or water daily. Water deep JUST once a week. When you water with drip irrigation or daily, the roots tend to grow towards the surface of the ground instead of reaching deep so that in a year or two they find their own water. Avoid watering so much that you see standing water. Trees can drown from too much water. 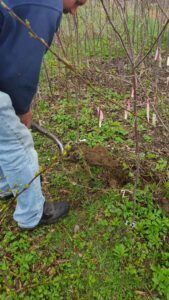 Ensure that you plant your bare root trees within a week of receiving them. If you are unable to plant them in their permanent location, it is good to put them into a temporary location like a garden bed or perennial bed and mulch them until permanent planting. Be careful when unpacking your trees! The roots may be tangled and can break easily while dormant.